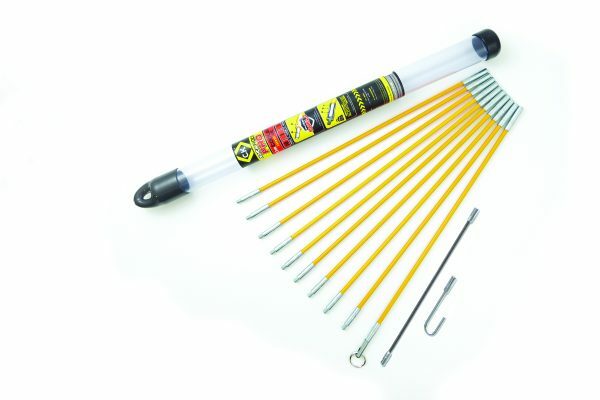 A compact handy toolbag size, offering efficient cable installation in confined spaces, the new set also has the added benefit of 100% splinterproof rods, thanks to their unique SplinterShield coating. Supplied in a storage tube, sized to fit most tool boxes and bags, the set is easily transported and includes 10 x 3cm rods, which, when combined, create a total length of 3.3m – offering a convenient and robust alternative to carrying full length rods. The 6mm rods feature SplinterShield, a significant advancement in cable rod technology and a European first: the durable, 100% splinterproof coating fully encases the inner fibreglass rod to prevent harmful and painful splintering. ‘Mighty-Fix’ zinc plated steel connectors feature a slimline design and are glued, indented and crimped, making them able to withstand up to 275kg of tensile pull strength. For further information, visit cktools.com.